petition: Please, help save the Florida Panther! 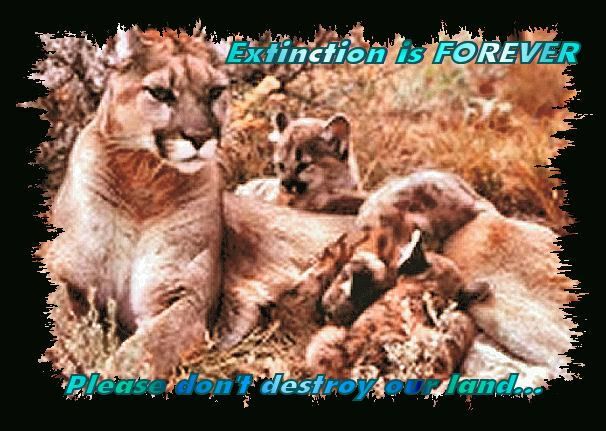 Please, help save the Florida Panther! ATTN: GOVERNOR CHARLIE CRIST FROM THE PEOPLE OF CARE2.com, THE WORLD OVER!The purpose of this petition is to make it known to the Government of Florida that it is no longer acceptable to put off a plan to save the Florida Panther. Our environment and wildlife has been put at great risk, and it is no longer a "sit back and wait" situation, we must take control and take the state back for our Florida Panthers, Manatees, Bald Eagles, Alligators, and all those suffering the effects of over-development. We know the time has come for a showdown with the developers and greedy politicians spread out all over our state. If they are allowed to continue to build uncontrollably we will no longer have the state we all know and love, but a skeleton of what once was a paradise. All that we know, all that we have loved all our lives will slowly die and disappear, including our beloved Florida Panther, as well as our Manatees, our beautiful birds, and just about every unique and special flora and fauna that reside here in this great state. Roads shouldn't drive land use decisions, and support is needed now for the Florida Forever Act (the state land acquisition program) to be funded at an increased amount during this legislative session. We also truly believe that Florida stands much more of a chance against global warming in it's most natural state, than it would as a block of cement.We know that you, Governor Crist, care deeply about our environment and our very unique and beautiful wildlife, and I and all those who co-sign with me, do hereby request an urgent resolution to the non-stop development of our beautiful state. I urge you respectfully to please read this incredible article, located at: http://www.nwf.org/nationalwildlife/article.cfm?issueID=114&articleID=1448 . If there is any information you feel you may still need this article will have the answer. I would also invite you to visit our Care2.com group at http://www.care2.com/c2c/group/FloridaPanthers , which is devoted to saving the panthers as well as other endangered Florida flora and fauna. The people signing this petition care deeply about the possibility of our already critically endangered Panther going extinct, and they are taking time to express their concerns from all corners of the world. I ask you kindly and respectfully to hear our plea. At the end of a cramped hallway inside the Florida Fish and Wildlife Conservation Commission%u2019s office in Naples hangs an emblem of the Florida panther%u2019s sorry plight. The marker board with the words "Panther Pulse" at the top displays a pair of critical lists: the known panther deaths and births so far this year. At the end of the workday Friday, the tally stood at 18 fatalities and 29 new kittens. Mark Lotz, a wildlife biologist with the Florida Fish and Wildlife Conservation Commission, takes a one year and eight month old female Florida Panther out of a freezer Monday, June 25, 2007 at the Naples office and loads it into a truck for transport up to the commission's office in Gainesville for a necropsy exam. The panther, killed by a car while crossing County Road 832 in Hendry county, was one of two Panthers killed in Southern Florida late Friday night or early Saturday morning. By Monday morning, the death toll had reached 20. Two panthers died late Friday or early Saturday on Southwest Florida roads, the 12th and 13th to perish this year after run-ins with vehicle grills. The first fatality broke a tie for most vehicle-related panther deaths in a single year, and the second elevated the record to a new high. Four of this year%u2019s road kills have come in June. State biologists who track the endangered animal see the sad statistic as an indication that the panther has succeeded beyond its means in Southwest Florida. "It could be evidence they%u2019ve shot up beyond carrying capacity, and they%u2019re coming down to a more stable level," said Mark Lotz, a wildlife biologist with the state wildlife commission. 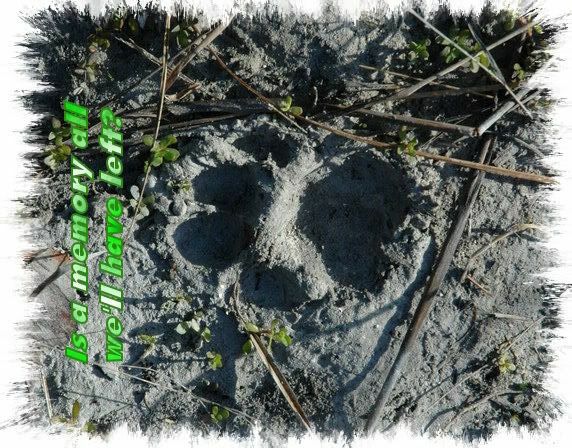 Collier County Sheriff%u2019s Office deputies reported a dead male panther Saturday morning lying on State Road 29, about two miles south of Immokalee. State wildlife biologist Darrell Land, who responded to the scene, estimated the cat to be 2-3 years old. Later that day, a staffer at Okaloacoochee Slough State Forest called in another dead panther, this one a 20-month-old female flattened along County Road 832 in Hendry County. The body was found about a half-mile west of the fire tower. The two locations are about 10 miles apart. It was the first time that panthers have been killed in unrelated accidents on the same day, according to state records dating back to 1972. The 13 panther collisions surpass the previous record of 11, set last year. The average number of annual road-related deaths in the 1990s was two. The surge in vehicular deaths has attracted the attention of two wildlife groups. Last week, the National Wildlife Federation and the Florida Wildlife Federation urged local, state and federal authorities to take certain steps to end the bloodbath. "At this pace, the best case scenario is that these panther death will just barely be offset by panther births," the nonprofits said in the two-page letter, which was written when the road kill total stood at 11. 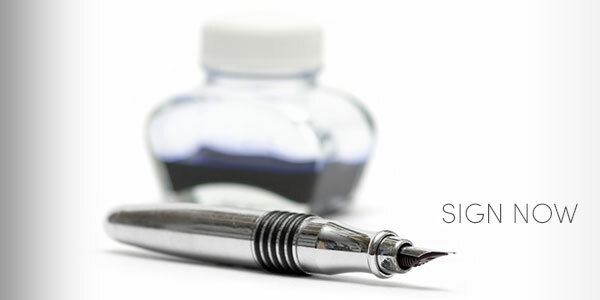 "In less than a week, it%u2019s an antiquated letter," said Nancy Payton, a Florida Wildlife Federation representative who was one of the letter%u2019s authors. %u2022 Developing a regional wildlife crossing plan for Lee, Collier and Hendry counties with the help of state transportation officials and wildlife biologists. %u2022 Extending fencing along State Road 29 in Jerome where two panthers have gotten trapped and run over; the most recent incident was June 11. %u2022 Adopting the westernmost alignment for the County Road 951 extension in southeastern Lee County, sparing panther-sensitive lands to the east. %u2022 Denying a bid to install an interchange on the Alligator Alley portion of Interstate 75 that would serve a proposed town called Big Cypress. Collier County commissioners are set to consider signing an agreement with the U.S. Fish and Wildlife Service at their July 24 meeting laying the groundwork for the creation of a network of wildlife crossings. Drafts suggest building underpasses and preserving wilds next to 22 roadway segments along S.R. 29 and Immokalee and Oil Well roads. Such efforts come with a hefty price. A pair of new wildlife underpasses on S.R. 29, a few miles north of Alligator Alley, cost nearly $4 million each. Dodging traffic has become the norm for panthers over the past decade. A successful breeding program boosted their population nearly threefold while a then-frothy real estate market thrust bulldozers inland, into panther territory. Federal scientists estimate that at least 480 panthers %u2014 in two populations of 240 %u2014 must be established before the species can be moved from the ranks of the endangered to threatened. Their single population now hovers around 100. If there is a silver lining in this year%u2019s road-kill data, Land said, it%u2019s that many of the cats were young males that are more easily replaced in the population than their female counterparts. But, he added: "It is a shame to see their potential go to waste when we%u2019re trying to make a bigger population." Both of this weekend%u2019s carcasses were taken Monday from Naples to Gainesville, where a state veterinarian will perform necropsies (an autopsy for animals) on the cats. Twenty panthers have died this year from all causes, including 13 vehicle strikes, four from unknown causes and two in fights with other panthers. A 15-year-old female panther that had been living at a Tampa zoo was put to sleep because of old age. Here is a look at the number of panther deaths on Florida roadways over the past five years. The average during the 1990s was two a year. We understand Governor that you must be quite aware of the situation, Defenders of Wildlife has an office here in which they spend much of their time fighting these developers, as do many other respected organizations. There are many serious problems within the FWS itself, and the job of protecting this state's resources is just not getting done. Native animals such as our panther need between 150 to 200 miles of territory for a single cat. The continuous development of natural areas in Florida and the disregard for wildlife is deeply frustrating and disturbing. Saving small areas here and there will not serve any purpose in protecting these species. All we end up with are fragmented areas separated by fences, roads, more cookie cutter housing, golf courses, shopping malls, and even more development and construction. One of the most amusing things you will see on a 4 lane highway in FL (along Alligator Alley, I75 for example) are Panther Crossing signs - honestly, does FDOT really think that adding these signs will accomplish anything? When a car is heading towards you at about 70 to 80 mph no one, not even a panther stands a chance. Would it have made more sense to not build the highway or the airport through panther habitat? Why haven't the "proposed" underpasses been built to ease to help our Panthers cross our deadly roads? If we really want to protect our wildlife and value our truly unique and beautiful big cats such as the last remaining panthers, our society and our government must consider what they value more; a mini-mall, gas station, or golf course on every possible corner or the trees and wildlife on which we depend on for our survival as a species ourselves, the decision must be made. The following article was just sent to me by Defenders of Wildlife, does it not move you, move your heart, to do something? FOR IMMEDIATE RELEASE April 6, 2007 Contact: Elizabeth Fleming, Defenders of Wildlife Three Panthers Killed By Cars in One Week Defenders of Wildlife Voices Concern for Disappearing Panther Habitat St. Petersburg, FL- Three Florida panthers have been killed by motor vehicles in the last week, raising serious questions about the conservation of this iconic species in south Florida. Defenders of Wildlife attributes these accidents to over development of the endangered panther%u2019s prime habitat, leading to more vehicle traffic and more panther fatalities as panthers look for new territory in ever-smaller patches of habitat. The growing number of panther deaths caused by vehicles indicates how vulnerable the panthers are in rapidly developing south Florida. New figures from the U.S. Census Bureau rank Collier and Lee counties among the nation%u2019s top ten fastest growing metro areas. "Much of the panthers%u2019 habitat has been degraded, fragmented or destroyed by development and road construction," said Elizabeth Fleming, Florida representative with Defenders of Wildlife. "The panthers%u2019 habitat is disappearing, forcing them to cross dangerous roadways in search of suitable options elsewhere." The panther is a protected endangered species under the federal Endangered Species Act, which prohibits anyone from killing a panther and prohibits federal agencies from authorizing, funding, or carrying out any action that could jeopardize the continued existence of the panther. Panthers once roamed much of the southeastern United States, but development has restricted them to just five percent of their historic range, and scientists estimate that there are only about 100 panthers left in southern Florida. Six panthers have been killed by vehicles since the beginning of 2007. Nearly 10 percent of the known panther population has been killed by vehicles in the last 12 months. "Local, state and federal governments should step up efforts to protect the panther and its habitat, but they continue to permit developments that destroy thousands of acres of the panther%u2019s home," Fleming continued. "By failing to use its authority to avoid or adequately mitigate the damage, the U.S. Fish and Wildlife Service is setting a dangerous precedent that disregards panther recovery needs and could jeopardize survival of the panther as well as other imperiled native Florida wildlife." In February of 2007, Defenders of Wildlife filed a notice of intent to sue the U.S. Fish and Wildlife Service and the Army Corps of Engineers for failing to properly assess the impacts of development in panther habitat. Defenders of Wildlife is recognized as one of the nations most progressive advocates for wildlife and its habitat. With more than 500,000 members and supporters, Defenders of Wildlife is an effective leader on endangered species issues. For more information, visit http://www.defenders.org/www.defenders.org. Every Species Has Value First and foremost, every species has intrinsic value. We, as the only species capable of understanding this value, must take every reasonable measure to protect an endangered and threatened species like the panther. Second, the Florida panther has aesthetic value. This majestic animal is one of the world's great cats. If we let them vanish, our world is diminished. Both of these reasons are sufficient to raise our concern. Nevertheless, there are also very practical reasons for protecting the Florida panther. Florida Panthers Maintain The Ecosystem As the top predator in its South Florida habitat, the panther is a necessary element in regulating the food chain. Predatory hunting by panthers helps keep the numbers of its prey--deer, wild hogs, and raccoon--in balance. Until recently, the positive role of predators was not understood. Wherever people settled, the presence of predatory animals was seen as a danger, and concerted efforts were made to eliminate them. The rule was to control predators through hunting and even poisons, not to "conserve" them. We now understand that panthers pose little danger to people. What's more, drastic control programs can severely upset the delicate balance of the natural ecosystem to the detriment of humanity, and disrupt the natural hierarchy and balance of animal populations. Predators such as panthers generally do not reduce the overall numbers of healthy prey populations. Just the opposite is true. Because panthers stalk and kill individual prey animals very selectively, they cull the sick and weak animals, as well as the very old and very young. This helps improve the stock of the breeding prey population, reduces disease, and lowers the chance of passing on genetic defects. It also recycles nutrients within the ecosystem. Furthermore, the presence of panthers keeps animals such as deer on the run, preventing overgrazing. In this way and others, the Florida panther serves as a valuable management resource, helping to maintain balance in the ecosystems of South Florida. Thank you Gov. Crist for taking the time to address this very urgent issue.